To commemorate the 50th anniversary of the Summer of Love, the city of San Francisco has created a trippy 13-poster series of "trading card" posters. Conceived by Kate Haug and produced by Ivan Uranga, both Bay Area artists, the groovy posters feature the "all-stars of 1967s counterculture and political scene," including the likes of Joan Baez, Timothy Leary, Jerry Garcia, Sly Stone, Sonny Barger, Bobby Seale, Lenore Kandel, Allen Ginsberg, Janis Joplin, Reverend Cecil Williams, Janice Mirikitani, Joan Didion, and even Ronald Reagan. Haug collaborated with Ivan Uranga to produce the poster’s bold graphic style. 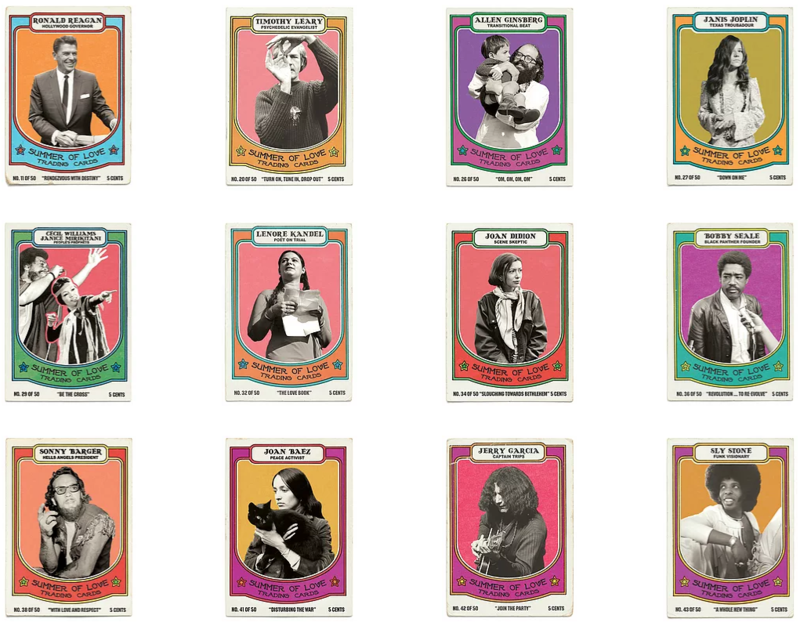 Drawing from the vernacular of trading card, black and white photographs of each personage is set against a vibrant background, reminiscent of the era’s psychedelic rock posters. Each figure is given a title that reflects his/her role in the Summer of Love. For example, Leary appears under the title “Psychedelic Evangelist” along with his famous call from the Human Be-In, the prelude to the Summer of Love, to “Turn on, tune in, and drop out.” The use of the trading card format suggests that these diverse legacies have been commodified, gaining and losing value through the passage of time. The series includes other details that are the artist’s own invention. For example, a price is included on the bottom of each card, which was not standard trading card practice. She also uses the figures’ birthdates for their serial number. For instance, Allen Ginsberg is number 26, because he was born in 1926. An exception is Janis Joplin; she is no. 27, the age at which she died. If you want to check them out, the oversized "trading cards" are currently hanging in bus shelters on Market Street, one of the city's main thoroughfares. San Francisco! Come see me and Richard Kadrey in Berkeley on Monday with my new book RADICALIZED! Next up: Portland/Ft Vancouver, Seattle & Anaheim! Thanks to everyone who came to last night's launch event at San Diego's Mysterious Galaxy! The next stop on my tour is an event at 7PM at The Strand in NYC where I'll be appearing with the award-winning investigative journalist Julia Angwin, who is pinch-hitting for Anand Giridharadas, who has had a family emergency.